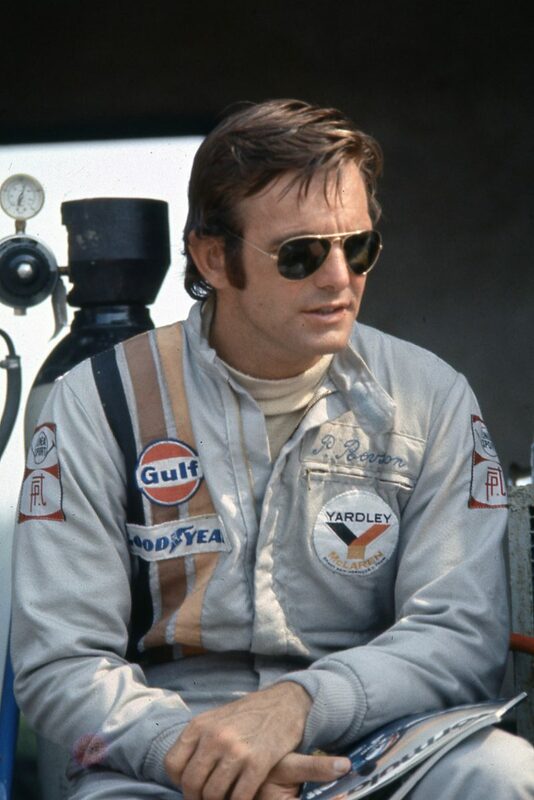 Peter Revson was born in New York City, the son of Julie (née Phelps) and Martin Revson. Revson began racing while at Cornell University. In 1968 he was part of the new Javelin racing program established by American Motors (AMC). At the first Trans-Am Series attempt, the 12 Hours of Sebring, Revson and Skip Scott drove to a 12th overall and took 5th in their class. In 1970 he teamed with Steve McQueen to place second in the 12 Hours of Sebring in the Porsche 908/2. Also in 1970, Peter Revson was teammates with Mark Donohue in the Penske Racing AMC factory-team Javelins in the SCCA Trans Am. Peter Revson then joined McLaren in 1971 and became the first American to win the Can-Am Championship. That same season he finished second in the Indianapolis 500 after posting the fastest qualifying time. Furthermore Peter Revson competed in the Indy 500 each year from 1969–1973. In 1972, Peter Revson was named to the McLaren Formula One team and remained with the team for two years, winning the British Grand Prix and Canadian Grand Prix in 1973, before moving to Shadow in 1974. He is the last American born driver to win a Formula One race (Mario Andretti, who won in later years, is a naturalized American). In 1996 Peter Revson was inducted in the Motorsports Hall of Fame of America in the sports car category. During a practice run for the 1974 South African Grand Prix in Kyalami, Peter Revson was killed as a result of suspension failure on his Shadow Ford DN3. He was the second Revson to lose his life racing; his brother Douglas was killed in a crash in Denmark in 1967. Peter and Douglas Revson are interred together in a crypt at Ferncliff Cemetery in Hartsdale, New York.